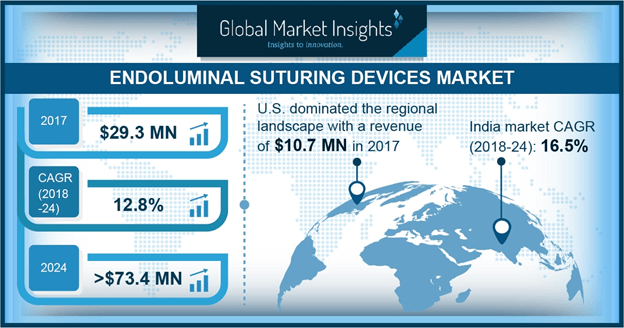 Endoluminal Suturing Devices Market size is set to exceed USD 73.4 million by 2024; according to a new research report by Global Market Insights. High preference for minimally invasive surgical procedures will boost endoluminal suturing devices market growth during the forecast period. Reduction in post-operative complications with use of minimally invasive endoluminal suturing devices will be the major factor driving business growth. Also, rising focus of major industry players towards development of minimally invasive surgical devices will spur industry growth. Reduced hospital stays, and no blood loss are other advantages associated with use of advanced endoluminal suturing devices across the forecast timeframe. Growing burden of chronic diseases including obesity and gastroesophageal reflux disease of will spur demand for endoluminal suturing devices in upcoming years. According to the Behavioral Risk Factor Surveillance System (BRFSS), in 2017, about 26.8% of the U.S. population did not undergo any form of physical activity. Increasing inclination of population towards unhealthy diet and sedentary lifestyle will be the major reason for high prevalence of chronic disease. This will lead to increasing adoption rate of endoluminal suturing devices for treatment of chronic diseases such as obesity. Gastrointestinal defects market accounted for largest revenue of USD 12.7 million in 2017. As number of people suffering from gastrointestinal defects is increasing, the demand for endoluminal suturing devices will increase in the future. Various advantages associated with endoluminal suturing devices such as enhanced flexibility and curved needle design will escalate use of endoluminal suturing devices for treatment of GI defects. With increasing population pool, gastrointestinal defects market segment will witness tremendous growth in the future. Hospitals segment is expected to expand at CAGR of 12.8% during the projected timeframe. Hospitals provide wide array of treatments for endoscopic submucosal dissections and other gastrointestinal defects to patients suffering from complex medical conditions. Moreover, availability of skilled professionals, increased preference towards hospitals and high funding opportunities will accelerate industry growth. Segmental growth is credited to increasing proportion of patient pool seeking treatment options in hospitals. UK endoluminal suturing devices market will grow at 13.0% CAGR, owing to high pervasiveness of obesity. According to The National Health Services Statistics on Obesity, Physical Activity and Diet, in 2017, prevalence of obesity increased to more than 27% across the country. Adoption of unhealth habits, sedentary lifestyle and suboptimal diet are major cause of high prevalence rate. Increasing government expenditure and high disposable income will further lead to business growth in the future. China endoluminal suturing device market occupied a significant share of 29.9% in 2017 owing to rapid increase in prevalence of gastroesophageal reflux disease. According to a study published in Gastroenterology Research and Practice in 2017, the prevalence of GERD in the country varied from 2.5% to 33.1%. High pervasiveness is due to increasing adoption of unhealthy diet patterns and lack of physical activity, thereby propelling industry growth. Some of the prominent players involved in endoluminal suturing devices market are Apollo Endosurgery, Inc., Medtronic and Johnson and Johnson (Ethicon Endo-Surgery, Inc.). These firms adopt strategic initiatives including mergers and acquisitions, new product launch and geographical expansion. For instance, in August 2017, Medtronic launched Proxisure suturing device intended to improve accuracy in minimally-invasive surgery. This strategy will deliver new value for customers eventually increasing company’s brand image.